The inspiration for this refreshing yet potent brew is the renowned Belgian classic, Duvel. The key attributes are light-ish body, high alcohol, and spritzy effervescence. A kiss of spicy-floral hop flavor helps to mask the formidable potency. The setting is a Japanese hanami (cherry blossom viewing) party. This alcohol-infused spring celebration provides an ideal opportunity for the exercise of bureiko jikan. 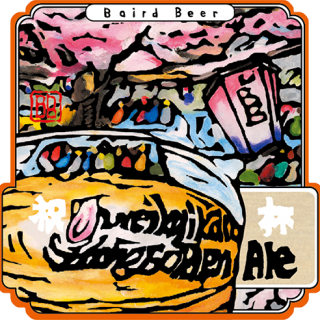 The party is in full swing and inebriation is sneaking up on its participants – as can be seen in the blurred label lettering swirling in a glass of this potent Strong Golden Ale. One key attribute of many Belgian Ales is strength without heaviness. This often is achieved by substituting a significant portion of the grain mash bill with sugar added to the kettle boil. The sugar is fully fermentable by yeast and adds alcohol strength without contributing anything in the way of residual body. The finished beer is thus strong yet crisp and dry. In the brewing of Bureiko Jikan Strong Golden Ale, we replace 20% of the mash bill with Japanese rock candy sugar in the kettle. We then add additional candy sugar along with krausen beer at packaging to kick-start a secondary fermentation which produces a finishing natural carbonation and sparkling effervescence. Our inspiration for Bureiko Jikan Strong Golden Ale is the classic Belgian Ale Duvel, one of the most wickedly delicious beers I have ever (over) enjoyed!